Sweeping changes at USARS, including new leadership and autonomy for sport committees, may put the governing body on the path to overcome its past mistakes. In a letter posted to its website, new USA Roller Sports President Dan Brown offered a status report on the “State of Skate,” or the current situation at USARS. The letter focuses exclusively on major internal and external changes, changes that USARS hopes will stop the self-inflicted bleeding and get it back on track to be a viable governing body for all rollerskating sports. This includes being a governing body roller derby, for which USARS Roller Derby now has more independence to meet its long-term goals. 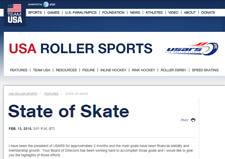 The full “State of Skate” letter is available on the USARS section of the Team USA website. Brown, who was only elected to the USARS presidency three months ago, has set two main goals for his term. The first was the roller-skating elephant in the room. However, USARS has been working to stop that trend. Last year, it reduced expenses by $250,000 by cutting staff and limiting insurance expenditures. For 2015, it will save nearly that much on insurance alone, having negotiated lower premium costs. To help with short-term cash flow, the US Foundation for Amateur Roller Skating has granted USARS a $200,000 loan to “support competitive roller skating.”1 That’s a nearly $700,000 positive revenue swing in only one year. Long ago, USARS had plenty of money lying around, but poor management squandered pretty much all of it. Brown promises that will not be the case in the future. “In the past, a budget was not always created or followed,” he acknowledged. “But for the coming season, the finance committee has worked hard to have a realistic budget that will ensure revenue to manage USARS programs.” A newly-elected treasurer will try to keep the ledger balanced going forward. A major part of the USARS revenue equation is how large its membership roll is. The more skaters that pay for the privilege of becoming a USARS member, the more money USARS has to run events and offer programs for them. But that only works with a large skater population. Once the skaters start leaving for competitors—ice skating or WFTDA roller derby, to name a few—those that are left are effectively made to fight over dwindling resources. Hence why the other top priority for the new leadership is to get people interested to come (back) to USARS and the variety of rollersport disciplines it offers. To do this, USARS has redefined the roles of the sport committees for the five USARS disciplines—rink hockey, inline hockey, speed, figure, derby—to give them more autonomy from the USARS mothership in matters of governance and rules. This motion essentially creates five “mini-USARS” bodies, each with independent responsibilities for their respective sporting discipline. The committees now have direct authority to develop budgets, organize tournaments and championships, appoint sub-committees for the selection of national teams2, and directly consider input from athletes, coaches, and clubs during sport committee meetings. Previously, all of those items were handled by the greater USARS board of directors. That setup led to a sense of disconnect between members and management and many situations where ideas for individual disciplines got lost in the bureaucratic shuffle. Those that did make it through were often poorly implemented. 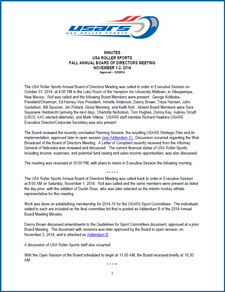 For the full details on the changes at USARS, see Addenda A and B in the 2014 Fall Board Meeting minutes. The key to the USARS plan is to reconnect with its existing membership and get it upbeat about recruiting. The idea is that these improvements and others will allow USARS athletes and coaches to worry less about whether or not the important behind-the-scenes stuff is being taken care of, letting them keep the focus on skating and grassroots efforts. This hands-off approach is good news for USARS Roller Derby, which now has more freedom to recover from lackluster attendance at previous national championships, and expand its program out to new areas. “We are extremely excited about it,” said Fernando Regueiro, chairman of the USARS Roller Derby Sport Committee and at-large member of the USARS board of directors. “For the last few years we did not have a lot of authority or autonomy to make decisions about the USARS Roller Derby program. Every initiative that we proposed had to be approved by the Executive Committee or the Board, leading to delays and, in some cases, roadblocks based on the lack of understanding or familiarity of these groups as it relates to derby. Regueiro explained that during the last USARS board of directors meeting in November, as new leadership was being installed, everyone came together to develop a series of strategic plans, including an improved communication plan. After just a few months of more freedom to enact policies and more open communication between the roller derby committee and the USARS board, Regueiro likes where things are headed. In addition to his duties at USARS, Regueiro is also affiliated with the Chicago Red Hots, a USARS club team that is making a splash in the midwest, attracting thousands of fans through just its fifth public game. The team was able to organize the first internationally sanctioned roller derby game and the first sanctioned game between men and women, seen below. Now that Regueiro can better act on that experience at USARS Roller Derby and on the full USARS board of directors, who knows where things can go? A rosy outlook is easier for USARS Roller Derby, however, having only been created in 2011. For those that have had to put up with USARS bumbling for much longer, initial reaction to the changes on social media was cautiously optimistic—which for many involved with USARS over the years, is as positive a reaction as a policy statement has received in some time. Only time will tell if the new USA Roller Sports will be able to live up to that goal. This is not quite the “Gift of $300,000” that USARS had originally sought out in previous board meetings. Which also includes the forthcoming roller derby Team USA—the USARS Team USA, not the World Cup one.